Searching for How To Save Facebook Videos To Phone Gallery, then you are landing on the right page. Here is a simple trick to save Facebook videos to your smartphone gallery. Many people searching on the internet for Facebook video Downloader apps and websites. But, you can easily download and save Facebook videos to phone gallery. If you are using the Facebook official app then there is an option to save Facebook videos for offline view. But, you can watch these videos only on the Facebook app. Also, you cannot save these videos in your smartphone storage. You may need to share that video on other messaging app or website. But, you need to save the video in phone gallery to share that video with your friends on other social networking services. Also, When you open Facebook in Chrome browser on your Android device, then when you tap on video then it plays online. But, you can save Facebook videos in Chrome browser. Also, many users use UC Browser. In UC browser, you can also download and save videos from Facebook. You can save Facebook videos on your phone using Chrome Browser or UC browser. 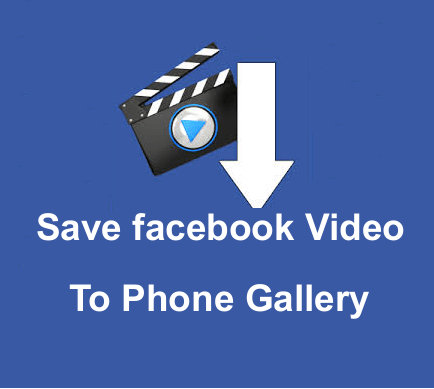 So, here is the complete guide of How to download and save Facebook videos to phone gallery. So, it is easy to save Facebook videos on your smartphone using Chrome browser. 1. Open Chrome Browser and Type m.facebook.com in the URL. 2. Log in to your Facebook account and tap on any video to play a video from the news feed. 3. Tap on the Comment option from below the video. 5. Now play the video and tap and hold on the video to download video from Facebook. That’s all. The downloading will be started after the tap on Download option. You may know the basic mobile version of Facebook. You need to open this by mbasic.facebook.com link. So, you can use basic Facebook version when your internet connection is slow. In the basic Facebook version, you can also download and save facebook videos. 1. Open mbasic.facebook.com from Chrome browser and log in to your account. 2. Tap on video from news feed to play the video. 3. When you play the video then you will see the Download Icon on bottom right corner of the video. Tap on Download Icon to download and save that video. If you are using UC Browser, then you can also download videos with UC Browser. Like Chrome Browser it is extremely simple to do this in UC browser. 1. Open UC Browser Mini and open Facebook by type m.facebook.com in URL. 2. Log in to your account and tap on any video from News Feed and it plays online. 3. Tap on the back button and you will see a Download Icon. Tap on the Download icon to save the video. So, you need a UC browser mini to download Facebook videos and save to phone gallery. You don’t need any other app to download Facebook videos. So, here are the steps of how to save Facebook videos to phone gallery. 1. At first, you need to download UC Browser Mini from Google Play Store. 2. After download and install UC Browser Mini on your Android device. Open UC Browser Mini. After that tap on the Menu (Three horizontal lines at bottom right) and tap on “Speed Mode“. 4. Log in with your email and password, and tap on any video. You will see a Play online and Download option. 5. Tap on “Download” to download and save Facebook video to phone gallery. So, these are the simple steps to download Facebook videos. After downloading, you will see the videos in your phone gallery. But, you may face a problem to see the video in your mobile phone gallery (You may face this problem if you set the UC Download location to SD card). But, don’t worry, the solutions of the problems are in FAQ given below. Q. Video is not found in phone gallery. A. 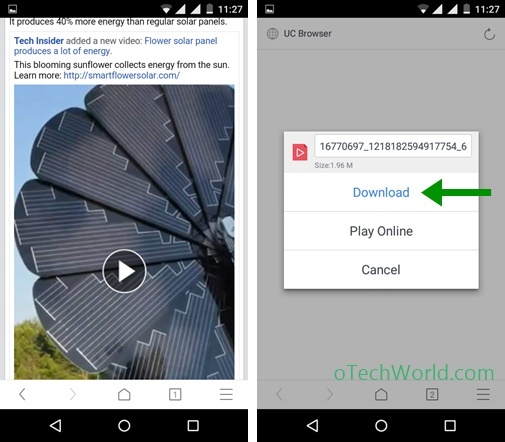 After downloading, if the video is not visible in your smartphone gallery then you need to move video from UC browser’s folder to another folder. Open File manager and Go to Storage (Phone or SD Card) > Android > Data > com.uc.browser.en > UCDownloads and move your video files to another video folder. So, this is How To Save Facebook Videos To Phone Gallery. Though, many people don’t trust on UC Browser. Because some rumors say, UC Browser steals some personal data of their users. Also, there is no need to use any third party website and tool to download and save Facebook videos from Facebook. Hey, this is really great! !A great resource to refer while looking for apps that help in downloading videos.I would also recommend you to try out this, for downloading FB videos at the quickest rater ever! Hi, this is really a great article..!! Just wanna ask that the m.facebook.com and then long tap on video used to work initially on my phone. But due to some reason, the option does not appear even after long tap. I use one plus 5. Any idea why is that? Open mbasic.facebook.com to download and save the videos. This video download feature stopped working. It worked great until January, 2018. I was using Chrome browser on my Galaxy S8 on Facebook’s mobile site. I would like to know what changed. New Trick Added to download facebook videos. Great. It works. Thanks a lot.